Goods once sold will not be taken back or exchanged. All equipments are guaranteed for any manufacturing defect for a period of 12 months from the date of invoice. Quote the name of the product and model number while ordering. All taxes applicable on the date of invoicing would be added to the prices given herein. Any damage in transit have to be informed to the company with in 15 days of receipt of the product. For Ernakulam packing and forwarding charges would be extra. 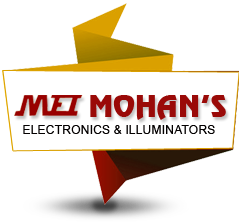 All payments to be made by either crossed account payee cheques of demand draft favouring "MOHAN'S ELECTRONICS AND ILLUMINATORS" and payable at Ernakulam. All transactions are made subject to Ernakulam jurisdiction.